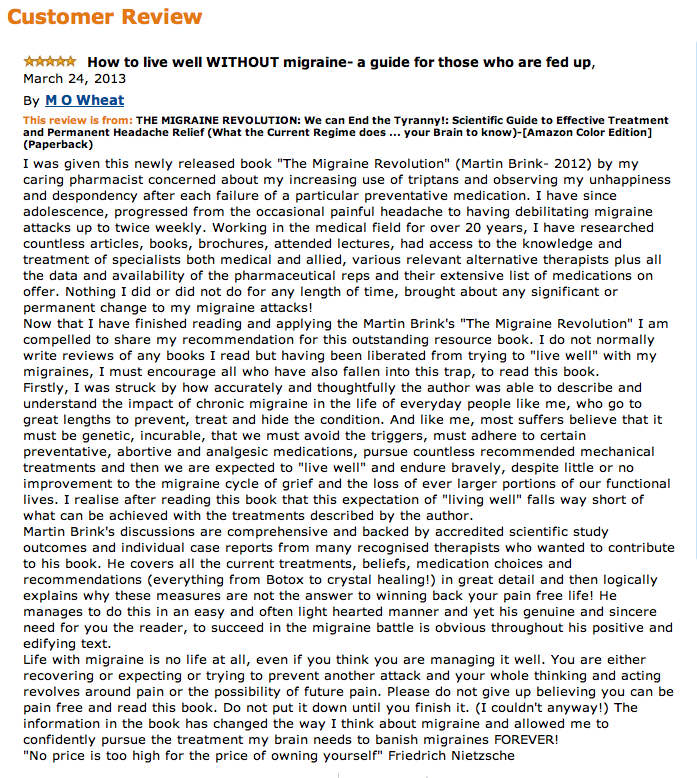 I was given this newly released book “The Migraine Revolution” (Martin Brink- 2012) by my caring pharmacist concerned about my increasing use of triptans and observing my unhappiness and despondency after each failure of a particular preventative medication. I have since adolescence, progressed from the occasional painful headache to having debilitating migraine attacks up to twice weekly. Working in the medical field for over 20 years, I have researched countless articles, books, brochures, attended lectures, had access to the knowledge and treatment of specialists both medical and allied, various relevant alternative therapists plus all the data and availability of the pharmaceutical reps and their extensive list of medications on offer. Nothing I did or did not do for any length of time, brought about any significant or permanent change to my migraine attacks! Now that I have finished reading and applying the Martin Brink’s “The Migraine Revolution” I am compelled to share my recommendation for this outstanding resource book. I do not normally write reviews of any books I read but having been liberated from trying to “live well” with my migraines, I must encourage all who have also fallen into this trap, to read this book. Firstly, I was struck by how accurately and thoughtfully the author was able to describe and understand the impact of chronic migraine in the life of everyday people like me, who go to great lengths to prevent, treat and hide the condition. And like me, most suffers believe that it must be genetic, incurable, that we must avoid the triggers, must adhere to certain preventative, abortive and analgesic medications, pursue countless recommended mechanical treatments and then we are expected to “live well” and endure bravely, despite little or no improvement to the migraine cycle of grief and the loss of ever larger portions of our functional lives. I realise after reading this book that this expectation of “living well” falls way short of what can be achieved with the treatments described by the author. Martin Brink’s discussions are comprehensive and backed by accredited scientific study outcomes and individual case reports from many recognised therapists who wanted to contribute to his book. He covers all the current treatments, beliefs, medication choices and recommendations (everything from Botox to crystal healing!) in great detail and then logically explains why these measures are not the answer to winning back your pain free life! He manages to do this in an easy and often light hearted manner and yet his genuine and sincere need for you the reader, to succeed in the migraine battle is obvious throughout his positive and edifying text. Life with migraine is no life at all, even if you think you are managing it well. You are either recovering or expecting or trying to prevent another attack and your whole thinking and acting revolves around pain or the possibility of future pain. Please do not give up believing you can be pain free and read this book. Do not put it down until you finish it. (I couldn’t anyway!) The information in the book has changed the way I think about migraine and allowed me to confidently pursue the treatment my brain needs to banish migraines FOREVER! 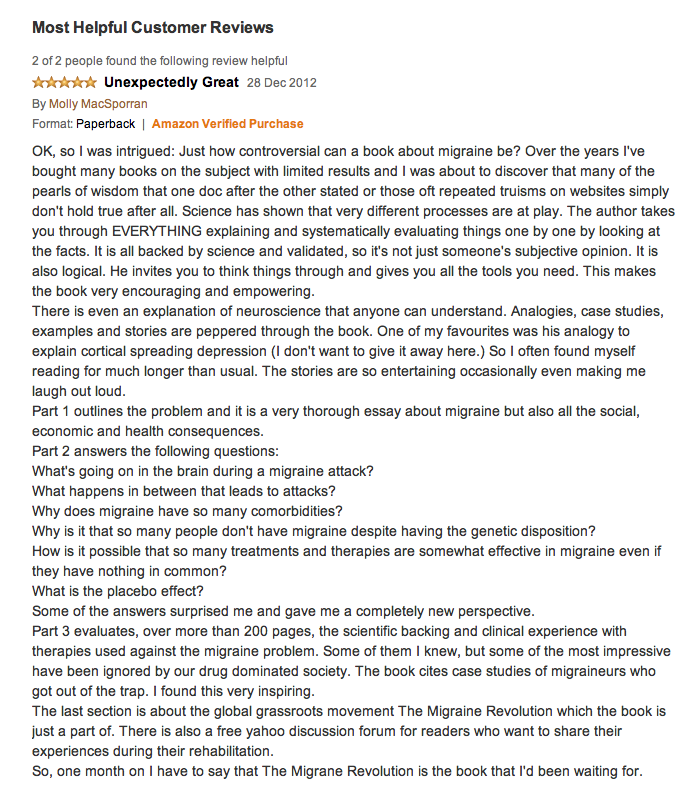 OK, so I was intrigued: Just how controversial can a book about migraine be? Over the years I’ve bought many books on the subject with limited results and I was about to discover that many of the pearls of wisdom that one doc after the other stated or those oft repeated truisms on websites simply don’t hold true after all. Science has shown that very different processes are at play. The author takes you through EVERYTHING explaining and systematically evaluating things one by one by looking at the facts. It is all backed by science and validated, so it’s not just someone’s subjective opinion. It is also logical. He invites you to think things through and gives you all the tools you need. This makes the book very encouraging and empowering. There is even an explanation of neuroscience that anyone can understand. Analogies, case studies, examples and stories are peppered through the book. One of my favourites was his analogy to explain cortical spreading depression (I don’t want to give it away here.) So I often found myself reading for much longer than usual. The stories are so entertaining occasionally even making me laugh out loud. Part 1 outlines the problem and it is a very thorough essay about migraine but also all the social, economic and health consequences. What’s going on in the brain during a migraine attack? What happens in between that leads to attacks? Why does migraine have so many comorbidities? Why is it that so many people don’t have migraine despite having the genetic disposition? How is it possible that so many treatments and therapies are somewhat effective in migraine even if they have nothing in common? Some of the answers surprised me and gave me a completely new perspective. 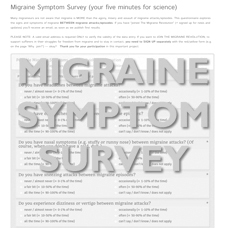 Part 3 evaluates, over more than 200 pages, the scientific backing and clinical experience with therapies used against the migraine problem. Some of them I knew, but some of the most impressive have been ignored by our drug dominated society. The book cites case studies of migraineurs who got out of the trap. I found this very inspiring. The last section is about the global grassroots movement The Migraine Revolution which the book is just a part of. There is also a free yahoo discussion forum for readers who want to share their experiences during their rehabilitation. So, one month on I have to say that The Migrane Revolution is the book that I’d been waiting for.